The Moon, in Astrology, is the ruler of Cancer. 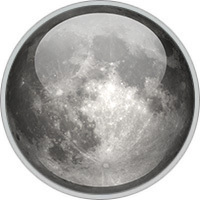 The Moon represents our deepest personal needs, our basic habits and reactions, and our unconscious. Where the Sun acts, the Moon reacts. How do we instinctively react or respond to problems? What do we feel we need for a sense of security? Look to the Moon in your natal chart for answers. The Moon is associated with the mother and with feminine energy in general. The Moon is both our inner child and our inner mother. It is responsive, receptive, and reflective. The Moon is our spontaneous and instinctual reactions. As you know, the full cycle of changing the lunar phases takes place in 29.5 days. The Moon in astrology is responsible for the rate of flow of life force in the human body. It is believed that the maximum speed of this flow in people born at full moon, and the minimum falls on the new moon. Just as the Moon circles the Sun, in a symbolically protective manner, and reflects the Sun’s light, the Moon in our chart shows how we protect ourselves, as well as make ourselves feel secure, comfortable, and safe. Since the Moon is the closest "planet" to Earth, this satellite literally zips around the zodiac, completing its circuit in less than a month. It also touches us more deeply than most planets.